Location: Prominently situated in the centre of Talley village to the S of the parish church. Established 1184-1189 by Lord Rhys ap Gruffyd for the Premonstratensian Canons. 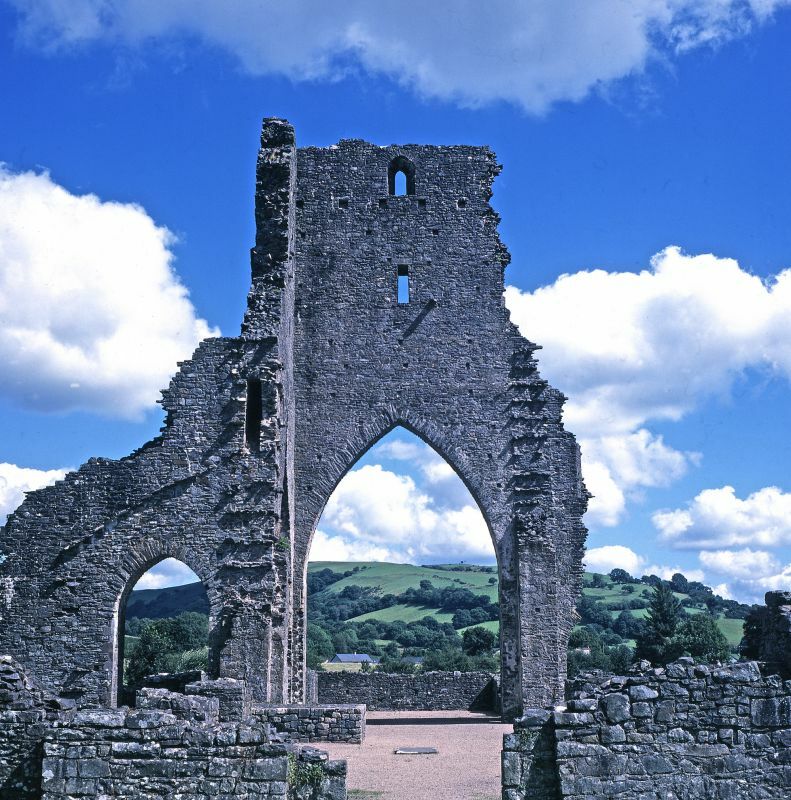 The building campaign was hampered from the start due to insufficient endowment and costly quarrels with the ambitious Cistercians at Strata Florida and Whitland. The building work was accordingly reduced in scale and the initial plans were never realised. In royal hands from 1278. Misrule, isolation and unwelcome royal intervention in the C14 and C15 led to decline and the Abbey's dissolution in 1536 went un-noticed. The abbey was spared immediate destruction and until 1773, the presbytery and choir were used as a parish church. Thereafter it became a quarry for local builders. In 1933, the guardianship of the ruins were entrusted to the commissiners of H.M Works. An ambitious abbey was planned, a 73m long Latin cross with aisles, square east end and transepts with eastern chapels, all very much in the Cistercian style. The N aisle and the four westernmost bays of the nave were only completed to foundation level and were then ignored during the difficult building programme. The N and E walls of the crossing tower stand to a height of 24m; of the rest, only low walls survive. Mural passages visible in tower. Transepts with similar plans having 3 eastern chapels, the springing of their former barrel vaults visible on the choir walls. Square ended presbytery with foundations of anteroom and sacristry to S. N and E crossing arches plain and unadorned. Simple corner shafts to NE crossing pier up to springing level. Foundations of nave piers intact; all are of coursed plain rubble except that to the SE, which has a chamfered plinth and moulded quoins. Blocking wall across N arcade and to W end. Foundation walls of S aisle.